Sunlight struggled to break through the dark curtains on this particularly crisp autumn morning. Gathered around her bed, were solemn tired faces that winced each time the oxygen machine recoiled. It broke the deafening silence as we each watched the rise and fall of my sister’s chest, unsure of when it would stop. At 10:34 AM, we felt her once palpable energy leave the room. Up until this moment, I’d lived a normal life. I’d never experienced death, although the thought of it terrified me. Where do we go? Where did she go? I found answers in the most unlikely of places. My father’s garden. A flower, like my sister, delicate but strong. Firmly rooted into the earth. It weathers the harshest of elements and each winter, it dies. And each spring, it grows again to share its powerful bloom with the world. The slow degradation is painfully beautiful. These images are a study of life and death. To maintain the most detail possible I used a flatbed scanner to photograph a Cissus plant each day for seven days. By laying it flat on the scanner glass this allowed the subtle quality of light to create the illusion that it is ascending within a dark, vacuous space. 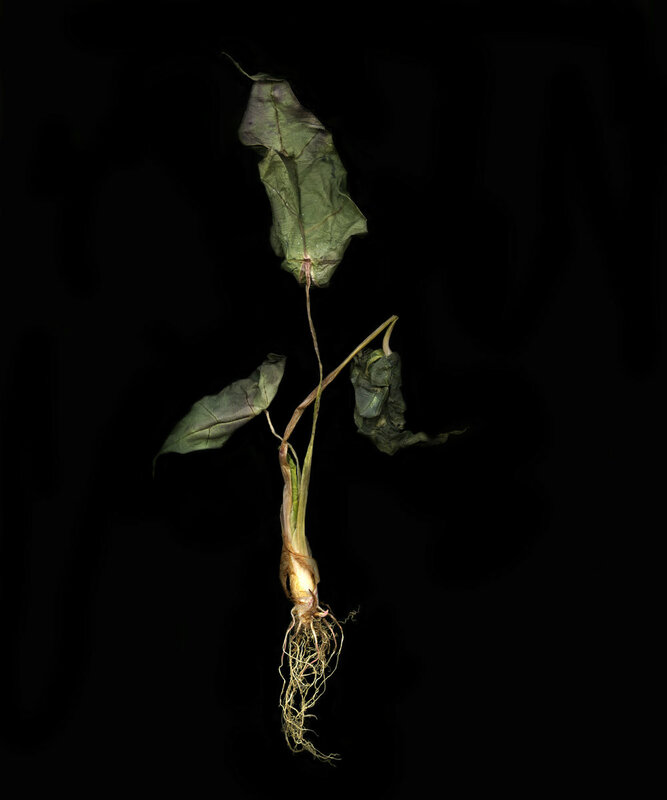 These plants are no longer a still life, but a portrait.